The Community Development Society (CDS) was founded in 1969 to create a national and international network of community development researchers, practitioners and policy makers with an interest in community development. 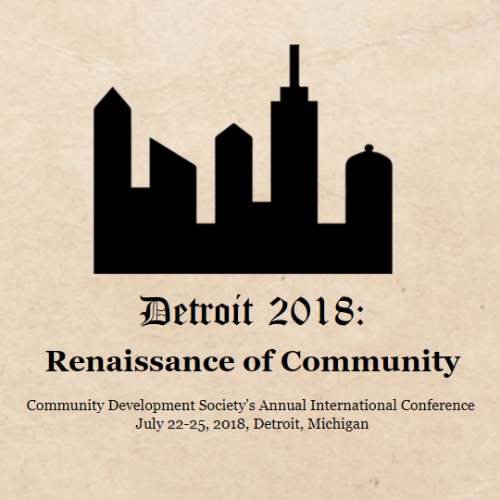 The CDS is requesting proposals for refereed presentations and posters relating to community development for presentation at the 2018 Community Development Society Conference, July 22-25, 2018 in Detroit, Michigan. Submissions relating to the conference theme, “Renaissance of Community” are encouraged, but all submissions will be given full consideration. Pre-conference Workshops: On Sunday July 22, 2018 we will be hosting pre-conference workshops that engage our membership in meaningful, intensive, and interactive sessions to gain new skills related to community development. Each workshop will be scheduled for a half day or a full day (2.5 hours or 5 hours). Ignite Sessions: An Ignite session is a method of sharing on an inspiring and exciting topic in 5 minutes using 20 Power Point slides, advancing automatically every 15 seconds. Ignite slides tend to incorporate excellence in slide design in support of a very clearly articulated message. Roundtables: Roundtables are 45-minute oral presentations with attendees seated around a table. Roundtable presentations typically include 15 minutes of presentation, followed by 30 minutes of discussion and feedback. Think Tank: A Think Tank is a session focusing on a single issue or question. Initially, a chairperson orients attendees to the issue or question and relevantcontext. Then, attendees break into small groups to explore the issue or question and finally reconvene to share their enhanced understanding through a discussion facili- tated by the chairperson. Birds of a Feather Gatherings: Birds of a Feather Gatherings, also known as idea exchanges or networking tables, are relatively small and informal discussion based gatherings, aimed at building networks and exploring ideas. This is the only session type for which there is NO formal presentation; instead the facilitators ensure that there is time for introductions amongst those in attendance and come with questions or ideas to spark discussion around a particular topic area.